See my trend? small, mini or micro prints for dolly clothes and quilts. It's just the mood I am in. p.s. 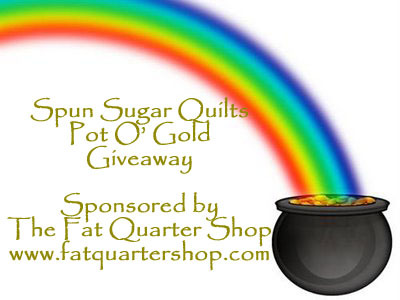 don't forget to enter the Pot o'Gold giveaway HERE. I love that you make the doll clothes! I think its so cute! Great looking fabrics. And happy birthday to your adorable Elly. They are such fun at that age. I am liking those dots! How fun. Those are fun fabrics. I have been collecting polk dots to make something fun with. They're addictive! Love all the gingham! Ohh, Hideaway! Just love it! May I ask where you got it? Very nice. Loving that green. I love the ginhams..I really like the bottom on with the circles!